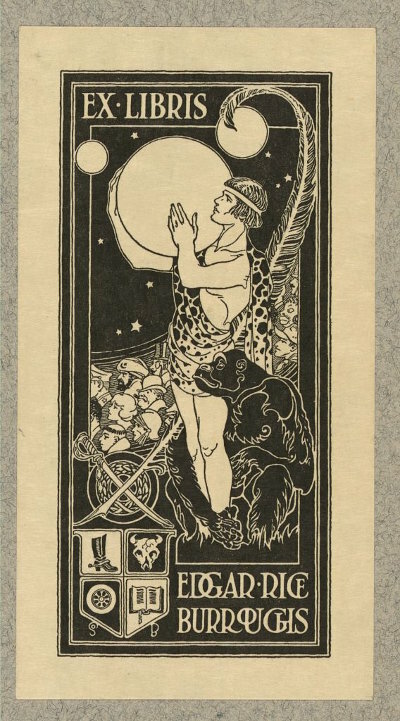 The central figure in the bookplate represents Tarzan. He is holding the planet Mars, above which are two Martian satellites. These because of my Martian series of stories. Grasping his legs is one of the great apes, among which Tarzan was reared. In the background are characters from several of my other stories. The crossed quill and sabre refer respectively to my writing and to my service in the United States Cavalry. These are again referred to in the shield in the spurred boot and the open volume. The steer's skull in the upper right hand quarter of the shield represents the time I spent in Idaho riding for a cow outfit. In the lower left hand quarter the automobile wheel refers to my love of motoring. Below the shield are my nephew's initials. My nephew designed this bookplate at my request, but entirely without any suggestions from me. Altogether it seems to me an unusually interesting piece of work. 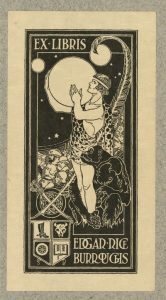 This entry was posted in Ex Libris Et Cetera and tagged Antique Ex Libris, Famous People. Bookmark the permalink.